Jogging and running has always been considered the "gold standard" of aerobics, anyone wanting to lose weight at an acceptable rate has considered taking up jogging/running just to see quick results. But as many of us have experienced there are many traumas associated with running, trauma to structures of the feet, dropped arch, shin splints, sprains, knee and hip injuries, as well as chronic disc and degenerative spinal conditions. But now thanks to Denis Naville the inventor of Kangoo Jumps we have a FUN way to get healthy, challenge the heart, save our joints and lose weight. Kangoo Jumps provides you all the benefits of rebounding. Rebounding is an exercise that reduces your body fat; firms your arms, legs, thighs, abdomen, and hips; increases your agility; strengthens your muscles and provides an aerobic effect for your heart. Scientific studies, made namely by NASA, show that rebound exercise is the most efficient, effective and pleasant exercise ever devised. Because your body is working against gravity, all your body cells, all your muscles, all your organs are challenged and trained to be their most efficient with each gentle bounce you do. Kangoo Jumps are the world's lowest impact shoes available. They protect (and actually reinforce!) your ankles, shins, knees, hips, lower back and spine. Kangoo Jumps, has a patented Impact Protection System, reducing the impact to your feet, ankles, knees, and lower back by up to 80%. 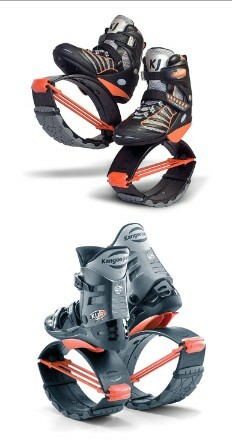 Kangoo Jump Boots improves balance, agility, and coordination and can be used indoors or outdoors. Toning & strengthening ALL your muscles with every bounce you do! 100 lbs. - 250 lbs. Anyone with the desire to increase caloric burn with a low impact high cardio exerciser! 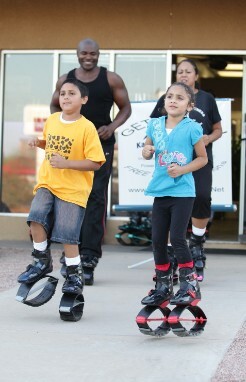 Kangoo Jumps are great for everybody, children and adults. It is a great way to get children involved in your exercise routine, they enjoy the jumping around, while you know they are exercising, burning calories, boosting lymphatic system, overall getting healthier while avoiding any joint injuries or any unnecessary stress to their growing body. And you, well you are toning up & dropping inches and you know that makes you a happier person! This is one exerciser that you won't lay clothes on or slide under your bed to be forgotten; it won't take up any space in your home, and if you have to move to a new home you won't need to ask family or friends to help you move it! The following video shows you how much fun Kangoo Jumps are; they also show how popular they are in Europe, and how you can use them indoors and outdoors, to walk, jog, run and dance in them!